Swings have always held a special fascination for us. As children, we used to play with them. Today we like to reminisce about the enjoyment which we felt while swinging. We felt disconnected from reality, weightless and free. “Swing” brings these feelings back and makes a dream come true: the dream of flying. 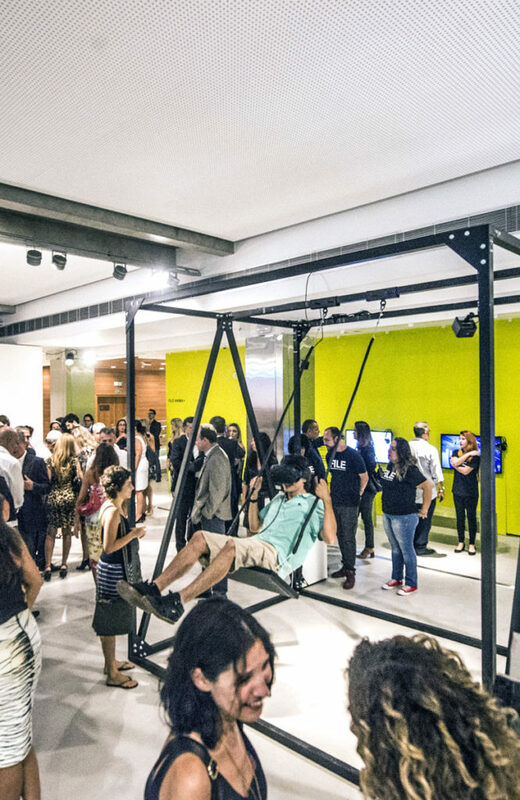 Thus, the swing becomes a physical component of an interactive installation. The use of 3D oculus enhances the swinging experience with virtual reality, creating a unique immersive adventure and sending you to a crafted watercolor world. While swinging you leave the drab monotony of everyday life behind, find a place to ease your mind and regain your strength. You rise smoothly into the virtual world. The flight level depends on how long and how high you actually swing. The starting point in the digital world is the same as in the physical world: the ground. Here everything is pale and dull. When you have the courage to swing more intensively, you will fly higher and the vibrancy of colors will increase. The climax is in space. Upon reaching it the world reaches its maximum in color intensity. If you want to go down, you have to stop swinging, but the colors around you will stay vivid and bright. Christin Marczinzik is an Interaction & Multimedia Designer, born in 1988 in Magdeburg, Germany. She graduated as a Bachelor in Industrial Design. Since 2013 she lives in Halle (Saale), Germany, where she studies Multimedia Design (M.A.) at the Burg Giebichenstein University of Art and Design. Thi Binh Minh Nguyen is a designer focused on Media Installations & New Games, born in 1987 in Vietnam, raised in Germany. She was nominated for international awards and now she’s studying Multimedia Design (M.A.) at the Burg Giebichenstein University of Art and Design in Halle (Saale), Germany.